The Spyder MR100 Pro is a very good gun recommended for both beginning players and advanced ones. It is lightweight, and it is made up of durable materials making its body strong enough to endure high-impact game play. It also comes with the new Eko-Valve technology that allows players to shoot as many 1600 in just one 20oz CO2 tank. The Eko-Valve technology that provides and impressive firing rate, along with this paintball marker’s accuracy are but two of the many advantages of this product. During tests, we have only discovered one con. The gun may shoot a little slower at times compared to other markers. A lot of people enter the world of paintball for the fun and the thrill. However, not everyone stays as well. If you are thinking of getting into the sport as well, then you might want to experience it first-hand at first, preferably with your friends so you get to know what the experience will feel like. The reason why a lot of people don’t stay in the sport for too long is because they get surprised on how it actually hurts – especially when they don’t have the proper equipment to assist them. And though we get why they would opt to sign out of the game instead, on the other hand, we love that pain as well. If you ask us, that is one of the game’s charms and it adds to the overall experience. In this light, if you are still unsure how long you are going to play, and how serious you are in playing paintball, it might be helpful for you to consider purchasing a starter gun first, something that can take the beating while you are still in the training phase, and something that would not require you to spend a ridiculous amount of money. 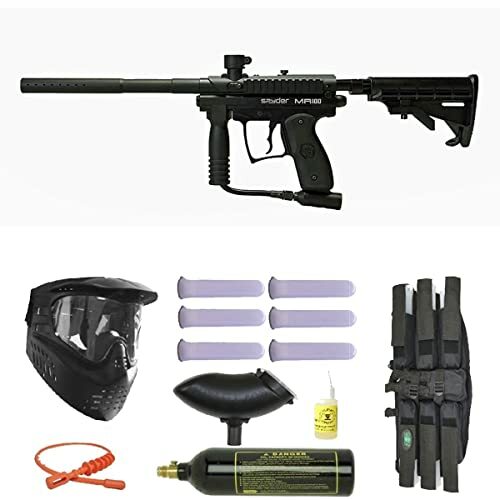 Allow us to help you out and provide you some information on one of the most recommended paintball marker guns for beginners, and even for more advanced players: Spyder MR100 Pro. The Spyder MR100 Pro paintball marker gun is very easy to find. You can purchase it in most paintball specialty stores. You can even purchase it online, either through Amazon, or through other trusted online sellers. Once you buy it, it will usually come along with the following items. First, of course, you’ll get the Spyder MR100 Marker. Then you will also get the other items included in the package like a visor with anti-fog lens, a CO2 tank (which is shipped empty of course), a paintball harness, and a 1oz bottle of Gold Cup Oil. Other items may be included in the package as well. The reason why this paintball marker gun is easy to find, is because it is very popular among players as well. Allow us to list down its many advantages below. It is very accurate. One of the advantages of this paintball marker gun is its accuracy. Even with longer yards, this gun will still be able to hit the target accurately. If you are a sniper type of player, this gun is highly recommended for you. It is lightweight. Sure, this gun is good for snipers, but can it also serve the purpose for Rambo-type players who play the game while actively running across the field? The answer is still yes. With its lighter weight compared to other paintball marker guns, you can run and roll with this baby easily. It is durable. Even though it is lightweight, its body is still made to endure. It has a pretty solid body with minimal moving parts, so you don’t need to worry about parts coming of in the heat of an active battle. It has a strong firing rate. We will take about more on this below in its features, but man, this paintball marker can really pack a lot of shots per second. A solid body. As what we have mentioned above, the Spyder MR100 Pro comes with a solid high-impact body that is made to endure the wear and tear of extreme game play. The Eko-Valve System. Now this is what we’re talking about. This baby has the unique technology of the new eko-valve system that allows you to shoot more than a thousand and five hundred shots from just a single C02 tank. 20oz CO2 Tank. Don’t worry, the tank is already included in the package so you can start testing out the paintball marker’s excellent firing rate. A quality mask. And finally, here is another thing that we are impressed about the entire package. A lot of paintball marker guns in the market only come with a regular stock mask, that you can use in the mean time while you’re searching for a nicer one to replace it. However, this baby on the other hand, comes with a high quality GXG XVSN Mask with anti-fog lens that you can actually use! Let’s now talk about the type of players who can use this product. The Spyder MR100 Pro is a very good starter gun. It’s not very expensive and it is very easy to use. Its accuracy and lightweight nature is a big help for beginner players as well. Are you the type of player who moves stealthily behind the obstacles, patiently waiting to do some headshots? Then you will enjoy having this baby for a paintball marker gun. As we have mentioned, the gun has been strategically structured to make shots easier and more accurate. Want to experience the action at its finest, running across the battlefield gun on hand while shooting everything that moves? Well, the weight of this gun will surely not wear you down. Not only that, it also comes with a durable strap to make handling easier. In order to provide a more accurate review, we have also gone through the different reviews that are already available online. In our research, we have found that this gun actually has one of the highest feedback rates compared to others. There are also very minimal negative comments about it as well. Overall, this is truly a gun made for everyone. Whether you are an experienced player, or someone who is just starting out, this paintball marker can live up to your expectations.